"I found this product amazingly effective, especially for bone health. Recommended it to two of my friends with chronic pain (hips in one case, knee in the other) and both reported vast improvement within a week, and the pain was gone completely after another week. I use the product also for hormonal balance, and it seems to be working just fine. I find the triple formulation (citrate, aspartate, glycinate) to be the most effective. The utility of boron for bone health should be more widely known, as it could prevent much unnecessary suffering and medical procedures." 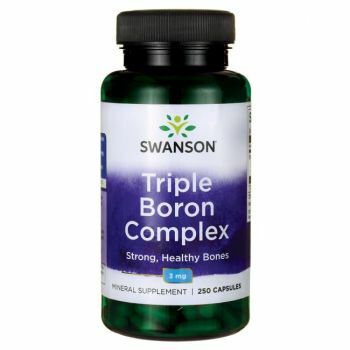 Take advantage of the vital mineral support of Swanson Triple Boron Complex if you want to have strong and healthy bones! This mineral, which is not so popular but plays an important role in maintaining healthy bones, can hardly be delivered through your daily regimen. Our special formula combines three forms of boron (citrate, aspartate and glycine) to provide maximum bioavailability.